We all think we know what spamming is. Even though spam and comments are not the same, why do many people not realise they are using spamming tactics when they comment on posts? How do you connect with the post's author? It's a good idea to greet the blog's author in your comment by using their name. However, fawning over them and calling them “my dear” is thoroughly nauseating and unnecessary. This kind of over familiarity is definitely not acceptable. Being extremely smarmy and offering ingratiating praise about the post is spamming tactics. Bloggers will not be swayed by this so-called flattery. Spammers do this because they want to get their comments published. They assume bloggers will react favourably when receiving such a response. Unfortunately this generally succeeds with newbie bloggers who are grateful to receive any comment. Did you read the post properly first? It's extremely annoying to get a comment that doesn't refer to the post’s subject. In fact any commenter who fails to properly read the post and understand its message will rapidly fall into the trap of spamming tactics. It's a common courtesy to thoroughly read the post in question before commenting. This means you will be able to provide a reasoned and appropriate response, suitably acknowledging the point made. Spammers aren’t interested in what you have written. If they congratulate you on the post's quality without mentioning the subject, this is another bout of flattery that is totally useless for you and your blog. Be careful when complimenting the blog's author about their vast knowledge of the post's subject. This is another spamming tactic that comes under the flattery banner. It doesn't provide any value to the comment at all. Spammers usually say they are extremely impressed by the information this post contains, and that they have bookmarked the post and shared it with their friends. Avoid being won over by this, it is just spammer’s flannel. The way to acknowledge the post’s content is to continue the argument or add your own extra valuable information. You could even ask a question to clarify a point, which is a great way to encourage a reply. Do you focus on being relevant? Avoid succumbing to one of the spamming tactics of just writing anything just to get your comment published. This is definitely what spammers do to promote a product or get unsuitable links to go live. They will write comments that contain any old drivel to make up the necessary amount of words to get past the moderation systems. None of this is relevant, worth reading or helpful to the post. It is important to keep to the point of the post, and avoid going off at a tangent. If you want to add another side of the story, refer back to the original. Make sure your contribution is meaningful. Any intention to connect with the blogger? One good reason to comment is to make connections within the blogosphere. Therefore it's worth taking the time to consider how you can contribute to the conversation and make a difference to others who read your comment. Spammers, however, will have thousands of posts to comment on. Their main purpose is to dump as many comments as possible on as many blogs as they can. They have no intention of making any worthy connection or contribution. It is easy to show suitable interest in the blogger to avoid being classed as using spamming tactics. Try extending the value of the post by sparking off a discussion on a particular point. And encourage other readers to comment as well to get a lively conversation going. Can you show a personal interest? Sometimes moderation systems could mistake an inexperienced commenter as a spammer if they don’t write enough in their comments. Comments that just say ‘Nice post’ could qualify as inappropriate spamming tactics. Since spammers have no information to write about, they cannot offer any more than the bare minimum. Their lack of interest means they cannot share personal experiences that relate to the post's subject. So to get round this, take the opportunity to provide a concise and well-written contribution that outlines your point of view. However, avoid writing too much, as this could undermine the original post and its author. Could you justify your response? No spammer will ever disagree with the post's author. This is not in their best interests. They want to get their comment published, and negative comments run the risk of being ignored or deleted. However, this doesn't mean you should shy away from voicing an opinion. If you ned to correct any facts, or your opposition is valid against the post’s subject, by all means share this within your comments. Remember, contradictory posts fare better if you have suitable justification and facts to back up your argument. Any author will value well reasoned feedback as long as it's constructive and forthcoming. Why not show some respect? Of course you should show respect to the blog’s author within your comment. However, you don't want to be seen producing obvious spamming tactics by providing ingratiating drivel balked up with useless and irrelevant content. The blog’s owner will acknowledge your respect once they realise their post has been read thoroughly, totally understood and properly appreciated. And the resulting feedback also uses suitable language that doesn't insult or undermine other readers. Being polite when expressing your point of view is bound to culminate in a flurry of responses. This will enhance the conversation and add value to the other readers’ enjoyment of the post. Ready to reveal your passion? A spammer is only passionate about getting their comment published so they can fulfil their dastardly deeds inside unsuspecting blogs. Whereas if you're an expert in your field, you could enthusiastically explain why you felt compelled to leave a comment. This process can easily result in an impromptu response, especially when it's fuelled by passion. Use emotional language to engage and capture the other readers' attention. Your persuasive word association and rhetoric will encourage a better response and encourage others to express their point of view. There won’t be many spammers who could match up to this. Have you thought about your wording? Spammers are not known for their ability to write well. Many look like they've been through a web translation application several times, resulting in weird sentence construction and peculiar spelling. Therefore not taking care in how you write your comments may get them accused as spamming tactics, since spammers are notorious for their strangely written comments. Anything a blog author cannot read properly will be treated as spam, or alternatively consigned to the ‘bin’. All comments should be written so they are understandable, with adequate spelling and good grammar. Anything below those expected levels is unlikely to pass through the moderation systems..
No spammers write to get a reply. This is something that never occurs to them. They are much too busy using spamming tactics to dump spam-ridden comments on as many blogs as possible. Whereas a proper commenter will focus on initiating a response either from the blog’s author, or from other readers and commenters. They will also return to check if there has been a response and to contribute further to any resulting conversations. The more discussions a blog has within its comments, the more it will appear to be popular. This popularity attracts the attention of the search engines, which are programmed to notice blogs with lots of comments. Do you try to avoid duplication? Consistent spamming can only be achieved through irresponsible spamming tactics. This is aided by copying and pasting the same comment everywhere, enhancing the irrelevance of comments on unsuitable blogs. I wonder if spammers are aware that duplication is heavily penalised by the search engines. As also new bloggers who are unaware that accepting spam undermines their blogs. You can check whether a comment is spam by Googling it to see if it appears anywhere else. A good commenter will always deliver original and bespoke contributions, carefully tailored to fit the blog’s subject and suitably written for its readers. After all, the blog’s author deserves nothing less. How are you avoiding spamming tactics? 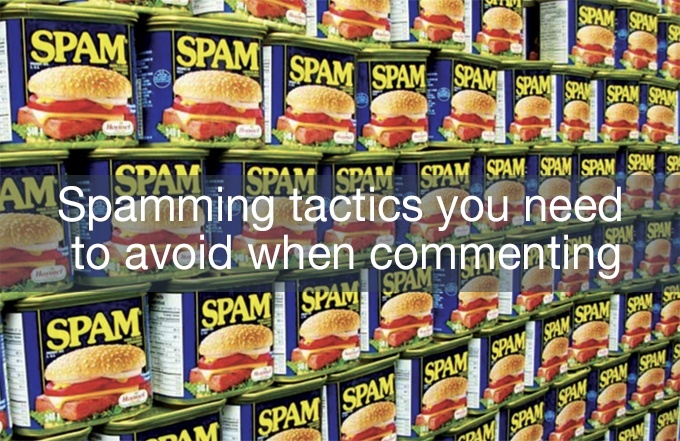 It’s worth noting the many spam characteristics to not fall into the trap of spamming tactics. Make a proper effort every time a comment is written and submitted, and take time to properly think about what you are going to say. It’s extremely important to know how to write good comments, ones that will acceptably pass the moderation systems and suitably enhance the post it is referring to. Good blog commenting is a dying art, especially with the rise of real-time communication on social media. Quick-fire commenting is becoming more like spam. Avoid going down that route if you want to be successful in leaving comments on blogs.